The dominance of beige in carpet colouring has been overtaken by brighter, fresher shades of soft grey, citrus shades of yellow, green and orange. Pinks and blues are also to be seen in greater numbers. Natural shades, and in many cases un-dyed wools are being used in berber styles. Stripes are becoming a common theme with matching plain shades to compliment, or pick out some of the stripe colours. 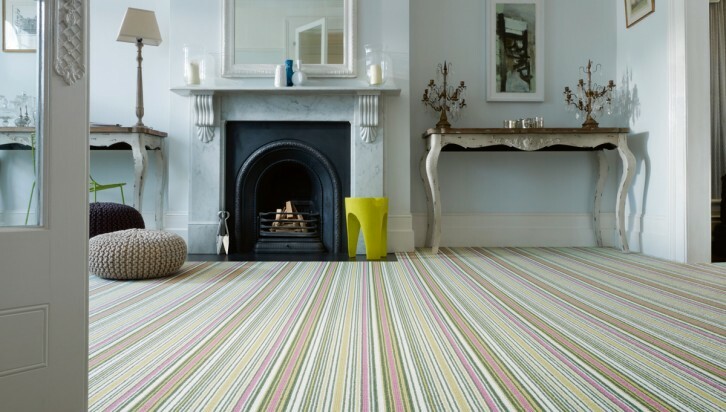 This means that you can have a stripe on the stairs and coordinate a colour for your hall or landing area. Stripes are also trending in bright colours and wider stripes. Pastel colours in large floral and small motif designs are featured in many interior design magazines as well as plaid and check tartans. So design is offered from one extreme to the other. Hounds tooth designs and 1960’s style circular and geometric patterns are now very popular, particularly in London and the south east of the UK. In wool twist and wool loops, rustic finishes offer a change from the plain beige of yesterday, and the biggest trend setter is Super soft carpet. Carpets that appeal to the sense of touch as well as to the eye! These are generally Saxony man made carpets although the technology of the fibre producers is now able to bring through super soft twist pile carpets that are suitable for anywhere in the home.